Shoptalk is the new blockbuster retail and ecommerce event with 5,000+ attendees, 250+ speakers and 500+ CEOs expected at its 2017 event. An unprecedented gathering of individuals and companies reshaping how consumers discover, shop and buy, Shoptalk provides a platform for large retailers and brands, startups, tech companies, investors, media and analysts to learn and collaborate. 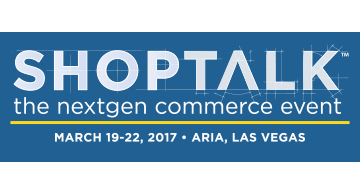 Shoptalk will be held on March 19-22, 2017 at the Aria in Las Vegas. For more information, visit www.shoptalk.com. Follow @shoptalk. Like facebook.com/shoptalk.